Traditionally, it is the Copts who look to America for support of their minority rights. With the Muslim Brotherhood now in the presidency, though not in full power, some Copts wonder if the United States is switching sides. The statement of ‘looking to America’ should not be taken as normative. The Orthodox Church and most leaders of influence insist on Egyptian solutions to Egyptian problems. They believe an appeal to the West would brand Copts as traitors in their own land. Average Copts, however, often state a sentiment of longing for America – either for pressure on Cairo or as an escape through emigration. Amid frequent meetings between Islamists and members of the US administration, however, some Copts believe Washington’s interests are beginning to trump its commitment to human rights. ‘We believe there is an alliance between the Obama administration and the Muslim Brotherhood,’ stated Bishoy Tamry, a member of the political bureau of the Maspero Youth Union, a mostly Coptic revolutionary group formed after attacks on Egyptian churches. ‘This alliance is to support fascism in the Middle East. The revolutionary character of the Maspero Youth Union plays a role in seeing the United States making a deal with the devil. Most of the United State’s foreign aid to Egypt is in the form of military support, with smaller percentages given to economic and civil society development. 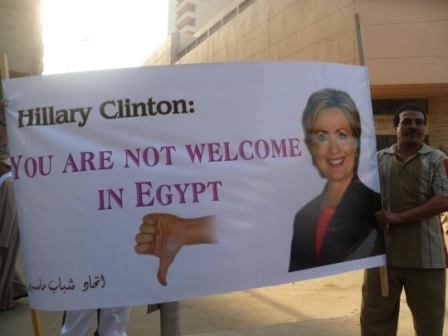 A few hundred people gathered at the US Embassy in Cairo to protest the visit of Hillary Clinton, the US Secretary of State. Early chants at the demonstration included, ‘The people and the army are one hand’, but these were silenced by Maspero Youth Union leaders. Tamry explained their group called for an open protest, and some attendees see the military council as the best means to limit or even depose Islamist rule. One such group is the supporters of Egyptian television presenter Tawfiq Okasha, somewhat comparable to America’s Glenn Beck. These are strong supporters of the military council and clashed briefly with assembled protestors when they arrived, according to Ramy Kamel, an independent Coptic activist helping organize the demonstration. This drove the protest ten minutes south to the Four Seasons Hotel. 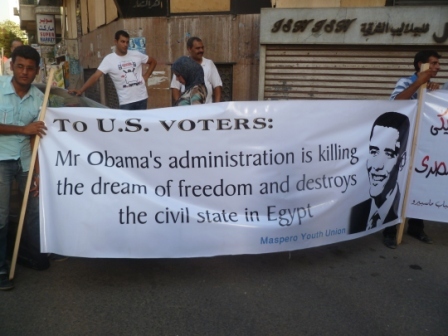 According to Nader Shukry, the media spokesman for the Maspero Youth Union, the United States is looking to preserve its interests after the Arab Spring shook their control of local governments. Yet their eye is not on the region’s good, but on its destruction. As for proof of this alliance, it is found in their frequent meetings. Others see this reasoning as absurd. 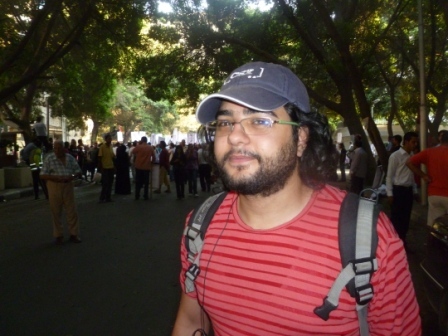 ‘The United States has relations with every nation in the world,’ said Raed Sharqawi, an investigative journalist present at the demonstration. 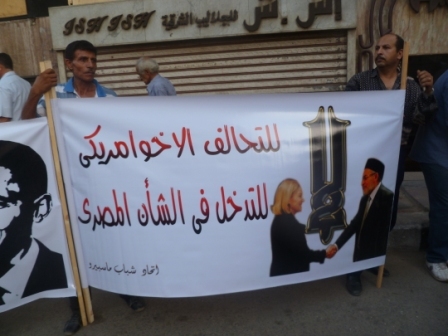 During Clinton’s visit she asked President Morsy to ‘assert the full authority of his position’. The president is currently engaged in a struggle with the military council over the dissolution of parliament. His party, the FJP is also pushing him to confront the military over its supplementary constitutional declaration to preserve some of its powers until a new constitution is written. Clinton did state the details of the transition should be left to the Egyptian people to determine, but urged the military return to its role of protecting the borders. It is an open and contested question if the military is seeking to preserve its power and resist the revolution, or if it is defending democracy against a premature Islamist takeover of all institutions of government. Nevertheless, whether the demonstrations against Clinton are foolish or astute, it is a dramatic step for a segment of the Coptic community to turn against the United States so publicly. Thank you, glad it was helpful. After the election of the Muslim Brotherhood the situation between coptics and muslims could become even more instable. I’m a filmmaker and I decided to address this issue. We currently developing a short film about a coptic christian and his relationship with his muslims neighbours in Cairo. The film is about feeling different in your own society, something that almost everybody felt at least once in their lives and for different reasons.